Shear Wall Blocking Methods on Horizontal Seams in Rated Siding. Homeowner’s Guide to Seismic Retrofitting. Do I Need an Engineer? This report describes American Plywood Association tests on wood blocking in plywood exterior siding such as T-111. APA Rated Siding products are evaluated for conformance to either APA’s Manufacturing Specification for 303 Siding or to APA’s Performance Standard for Siding. The performance standard includes criteria for evaluation of structural performance, dimensional stability, and durability. The factors that affect siding performance have been evaluated through extensive research. Both structural performance and dimensional stability are based on the recommended maximum support spacing denoted in the Span Rating. Testing has shown that siding panels with a Span Rating of 16 oc have sufficient stiffness and strength under uniform loads to perform satisfactorily in applications with studs spaced 24″ o.c. when additional blocking is provided. Satisfactory structural performance for wall bracing or shear applications has also been demonstrated in tests conducted at APA’s Research Center. There is also a concern whether siding panels span-rated at 16 o.c. but used at 24″ o.c. will remain flat without buckling between studs under exterior moisture conditions. Laboratory tests indicate that additional support provided by horizontal blocking improves the rigidity of the panel, thereby improving the stability performance of the siding. APA Rated Siding includes plywood, non veneer and composite panel products that have undergone stringent laboratory evaluation to assure satisfactory performance in exterior siding applications. 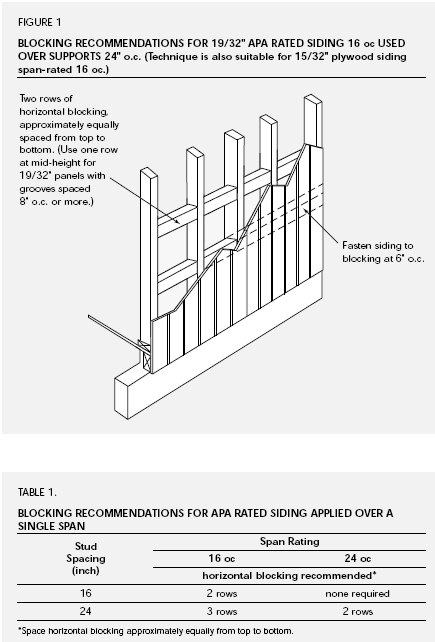 The Span Rating included in the APA Rated Siding trademark denotes the maximum support spacing recommended. It applies when the siding is to be installed directly to supports over two or more spans (continuous over at least three supports). These and other application details for APA Rated Siding are published in APA Design/Construction Guide – Residential & Commercial (Form E30). The desire to extend a siding application beyond these recommendations occasionally arises due to various availability or construction constraints. Where necessary, the techniques suggested below can be used for 19/32″ APA Rated Siding 16 oc applied over studs spaced 24″ o.c., and for siding panels used over a single span. Recommended blocking for 19/32″ APA Rated Siding 16 oc applied over studs spaced 24″ o.c. is shown in Figure 1. Two horizontal rows of blocking are recommended, except that 19/32″ siding with grooves spaced 8″ o.c. or more requires only one row of blocking. The blocking shown in Figure 1 is also applicable to 15/32″ plywood siding span-rated 16 o.c applied over studs spaced 24″ o.c. Blocking may be 2x4s used edgewise or flatwise or 1x4s inset into the studs. The siding is nailed 6″ o.c. alongthe blocking. Table 1 presents blocking recommendations for siding installed over single spans. The blocking techniques and nailing recommendations are the same as above, except that the number of rows of blocking required depends upon the Span Rating and the stud spacing. This website is intended to help clients of Bay Area Retrofit to understand their retrofit proposals. IT IS NOT INTENDED AS A GUIDE FOR DIY RETROFITS. Retrofit design is based on many factors. Each house is unique. Bay Area Retrofit does not recommend performing a retrofit without the guidance and supervision of experienced and knowledgeable retrofit professionals, and is not responsible for costly errors, injuries, or earthquake damage that result from such attempts. Bay Area Retrofit assumes no responsibility or liability for use by homeowners, contractors, engineers, or anyone else of the information provided on this site.